"It deserves to be known how a shoulder which is subject to frequent dislocations should be treated. For many persons owing to this accident have been obliged to abandon gymnastic exercises though otherwise well qualified for them; and from the same misfortune have become inept in warlike practices and have thus perished. And this subject deserves to be noticed because I have never known any physician (to) treat the case properly; some abandon the attempt altogether and others hold opinions and practice the very reverse of what is proper." "In every case the anterior margin of the glenoid cavity will be found to be smooth rounded and free of any attachments and a blunt instrument can be passed freely inwards over the bare bone on the front of the neck of the scapula." "...the only rational treatment is to reattach the glenoid ligament (or the capsule) to the bone from which it has been torn." Shoulder stabilization surgery usually can be accomplished through cosmetically acceptable incisions in the lines of the skin. Posteriorly an analogous vertical incision in line with the extended posterior axillary crease (best visualized by extending the shoulder backwards) also heals well. Fortuitously these creases lie directly over the joint to which the surgeon needs access. The shoulder is covered by the deltoid muscle arising from the clavicle acromion and scapular spine. The anterior deltoid extends to a line running approximately from the midclavicle to the midlateral humerus. This line passes over the cephalic vein the anterior venous drainage of the deltoid and over the coracoid process. The deltoid is innervated by the axillary nerve whose branches swoop upward as they extend anteriorly. The commonly described "safe zone" 5 cm distal to the acromion does not take into account these anterior branches which may come as close as 2 cm to the acromion. At the deltopectoral groove the deltoid meets the clavicular head of the pectoralis major which assists the anterior deltoid in forward flexion. The medial and lateral pectoral nerves are not in the surgical field of shoulder stabilization. Splitting the deltopectoral interval just medial to the cephalic vein preserves the deltoid's venous drainage and takes the surgeon to the next layer. It is important to note that extension of the shoulder tightens the pectoralis major and the anterior deltoid as well as the coracoid muscles compromising the exposure. Thus assistants must be reminded to hold the shoulder in slight flexion to relax these muscles and facilitate access to the joint. Posteriorly the medial edge of the deltoid is too medial to provide useful access to the glenohumeral joint. Access must be achieved by splitting the deltoid which is most conveniently done at the junction of its middle and posterior thirds. This junction is marked by the posterior corner of the acromion. The site is favorable for a split because it overlies the joint and also because the axillary nerve exiting the quadrangular space divides into two trunks (its anterior and posterior branches) near the inferior aspect of the split. The coracoid process is the "lighthouse" of the anterior shoulder providing a palpable guide to the deltopectoral groove a locator for the coracoacromial arch and an anchor for the coracoid muscles (the coracobrachialis and short head of the biceps) that separate the lateral "safe side" from the medial "suicide" where the brachial plexus and major vessels lie. The surgeon comes to full appreciation of the value of such a lighthouse when it is lacking--for example when re-exploring a shoulder for complications of a coracoid transfer procedure. The clavipectoral fascia covers the floor of the deltopectoral groove. Rotating the humerus enables the surgeon to identify the subscapularis moving beneath this fascial layer. Incising the fascia up to but not through the coracoacromial ligament preserves the stabilizing function of the coracoacromial arch. The humeroscapular motion interface (see figures 1 and 2) separates the structures that do not move on humeral rotation (the deltoid coracoid muscles acromion and coracoacromial ligament) from those that do (the rotator cuff long head of the biceps tendon and humeral tuberosities). During shoulder motion substantial gliding takes place at this interface (see figure 3). The humeroscapular motion interface provides a convenient plane for medial and lateral retractors and is also the plane in which the principal nerves lie. The axillary nerve runs in the humeroscapular motion interface superficial to the humerus and cuff and deep to the deltoid and coracoid muscles (see figure 4). Sweeping a finger from superior to inferior along the anterior aspect of the subscapularis muscle catches the axillary nerve hanging like a watch chain across the muscle belly. Tracing this nerve proximally and medially leads the finger to the bulk of the brachial plexus. Tracing it laterally and posteriorly leads the finger beneath the shoulder capsule toward the quadrangular space. From a posterior vantage the axillary nerve is seen to exit the quadrangular space beneath the teres minor and extending laterally where it is applied to the deep surface of the deltoid muscle. By virtue of its prominent location in close proximity to the shoulder joint anteriorly inferiorly and posteriorly the axillary nerve is the most frequently injured structure in shoulder surgery. The musculocutaneous nerve lies on the deep surface of the coracoid muscles and penetrates the coracobrachialis with one or more branches lying a variable distance distal to the coracoid. (The often-described 5 cm "safe zone" for the nerve beneath the process refers only to the average position of the main trunk and not to an area that can be entered recklessly.) The musculocutaneous nerve is vulnerable to injury from retractors placed under the coracoid muscles and to traction injury in coracoid transfer. Knowledge of the position of these nerves can make the shoulder surgeon both more comfortable and more effective. 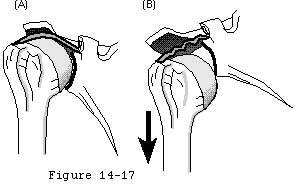 The next layer of the shoulder is the rotator cuff. The cuff is relatively thin between the supraspinatus and the subscapularis (the "rotator interval"). This allows the cuff to slide back and forth around the coracoid process as the arm is elevated and lowered. Splitting this interval toward the base of the coracoid may be helpful when mobilization of the subscapularis is needed. The tendon of the long head of the biceps originates from the supraglenoid tubercle. It runs beneath the cuff in the area of the rotator interval and exits the shoulder beneath the transverse humeral ligament and between the greater and lesser tuberosities. It is subject to injury on incising the upper subscapularis from the lesser tuberosity. In the bicipital groove of the humerus this tendon is endangered by procedures that involve lateral transfer of the subscapularis tendon across the groove. The glenohumeral joint capsule is normally large loose and redundant allowing for the full and free range of motion of the shoulder. By virtue of their mandatory redundancy the capsule and its ligaments are lax throughout most of the range of joint motion. Thus they can exert major stabilizing effects only when they come under tension as the joint approaches the limits of its range of motion. Codman (Codman 1934) and others pointed out the variability of the ligaments. (Delorme 1910; DePalma 1973; Ferrari 1990; Moseley and Overgaard 1962; O'Brien et al 1990b; Williams et al 1994) These authors also demonstrated a great variation in the size and number of synovial recesses that form in the anterior capsule above below and between the glenohumeral ligaments. They observed that if the capsule arises at the labrum there are few if any synovial recesses (in this situation there is a generalized blending of all three ligaments which leaves no room for synovial recesses or weaknesses and hence the anterior glenohumeral capsule is stronger). However the more medially the capsule arises from the glenoid (i.e. from the anterior scapular neck) the larger and more numerous are the synovial recesses. The end result is a thin weak anterior capsule. Uhthoff and Piscopo (Uhthoff and Piscopo 1985) demonstrated in an embryological study that in 52 specimens the anterior capsule inserted into the glenoid labrum in 77 per cent and into the medial neck of the scapula in 23 per cent. When the humerus is elevated anteriorly in the sagittal plane (flexion) the posterior-inferior capsular pouch along with the rotator interval capsule come into tension. 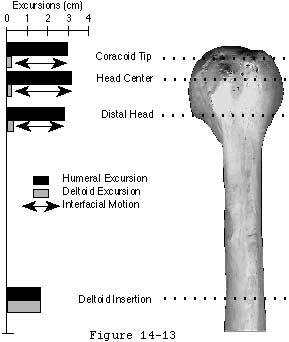 (Harryman et al 1990; Harryman et al 1992; O'Brien et al 1990a; Rhee et al 1994; Warner et al 1992) If the humerus is internally rotated while elevated in the sagittal plane the interval capsule slackens but the posterior inferior pouch tightens. Posterior-inferior capsular tension also limits flexion internal rotation and horizontal adduction. (Harryman et al 1990; Harryman et al 1992; Rhee et al 1994) Excessive tightness of this portion of the capsule is a well-recognized clinical entity. The glenoid labrum is a fibrous rim that serves to deepen the glenoid fossa and allow attachment of the glenohumeral ligaments and the biceps tendon to the glenoid. Anatomically it is the interconnection of the periosteum of the glenoid the glenoid bone the glenoid articular cartilage the synovium and the capsule. While microscopic studies have shown that a small amount of fibrocartilage exists at the junction of the hyaline cartilage of the glenoid and fibrous capsule; the vast majority of the labrum consists of dense fibrous tissue with a few elastic fibers. (Gardner 1963; Moseley and Overgaard 1962; Townley 1950) The posterior-superior labrum is continuous with the long head tendon of the biceps. Anteriorly it is continuous with the inferior glenohumeral ligament. (Grant 1972; Moseley 1945; Moseley 1972; Trillat and Leclerc-Chalvet 1973) Hertz et al (Hertz et al 1986) detailed the micro anatomy of the labrum while Prodromos et al (Prodromos et al 1990) DePalma (DePalma 1973) and Olsson (Olsson 1953) have described the changes in the glenoid labrum with age.